The deep ocean empire of Nautica was established many thousands of years ago before the inhospitable surface world was fully formed. The Nautican Empire pre-dates the histories of all the surface dwelling races and the very existence of the oldest land based creatures. The first incursions from the realms of Chaos was almost cataclysmic for the Nauticans. Terrible underwater wars, for which the Nauticans were ill prepared, were fought and Chaos all but destroyed the once proud underwater civilisation. What remained of the Nautican people hid themselves in deep ocean trenches, protected from the outside world with what remained of their elemental magics. As the ages passed the Nauticans established small kingdoms and provinces in secret places on the ocean beds beyond the minds or imagination of any surface dweller or even the Daemons of Chaos. The Nauticans remained a small race, never again to achieve the greatness of the old ocean empire. As the Chaos incursions ravaged the surface world the Nauticans were ever vigilant and made every effort to protect the ocean floor and keep their presence in the world a secret. For millenia the Nauticans were successful in their endeavours and they lived peacefully learning to work in alliance with ocean creatures and in unison with the natural ways of the deep. 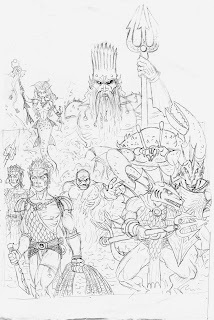 The Nautican mages and soothsayers foresaw the tragedy before the gates of Chaos opened between the tectonic plates and the underwater world was torn asunder by submarine volcanos, devastaing quakes and grotesque underwater daemons intent on reaping their God's will on the forces of law and nature. The deep had become uninhabitable, the Nauticans had no choice but to find safe dwellings in shallower coastal waters, their survival depended on it. It was inevitable that the Nauticans would come into contact with the surface dwellers. 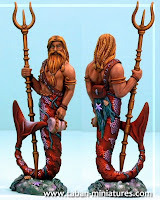 The Nautican nobility and their people are bipods and are generally similar in stature to slimline humans and elves although just like other creatures of the deep their appearance is as variable as the oceans they inhabit. Typically a Nautican will stand slightly bowed but six feet in height when fully upright. Most Nauticans have black shark like eyes that can see deep into the dark ocean depths, their hands and feet are usually webbed and they bear residual scales on their necks, wrists and ankles that all help to streamline their bodies for ocean life. Some Nauticans living deeper beneath the ocean waves, such as the ceatures making up the ranks of the Trident Guard, are reptilian in appearance and sport tails and fins like their aquatic brethren. Older Nauticans bear repitilian like spines on their backs and crests on their heads, these are seen as marks of knowledge, wisdom and experience that may extend for up to a millenia in man years. The Nautican's wide jaws host gills that they can use to breathe underwater or to syphon the surface air for the short hours* they can survive out of water before they need to return for vital salts and nutrients. The Nautican seers believe their race are the ancestors of the humans and the Elves and that the Nautican people have some great part to play before the end of times when the seas will once again engulf the world. * Nauticans are able to breathe the surface airs for several hours at a time albeit not comfortably. Their presence on land is helped by the powerful elemental magic that surrounds the Nautican army and keeps the air moist and cool.